Throughout history, equations have been pulling the strings of society. Tucked away behind the scenes, to be sure — but the influence was there, whether it was noticed or not. “In Pursuit of the Unknown” is written by Ian Stewart, a professor Emeritus of Mathematics and author of a number of books on Mathematics. 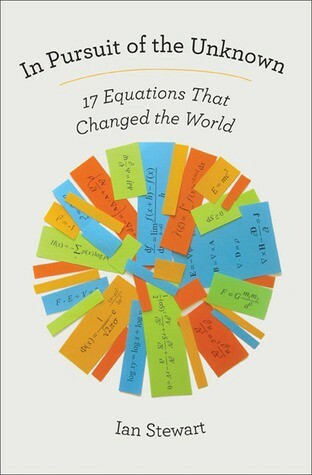 A chapter is devoted to each equation where its meaning, importance, history and influence is explored in detail. “In Pursuit of the Unknown” is reasonably comprehensive. We get to spend quite a bit of time with each equation and at the end of each chapter, we get to have an introductory understanding of it. The exploration of the history behind the equation and events that followed it gives us a feel for how this equation has changed this society. The equations are also arranged in an ascending scale of complexity roughly. I also liked the fact that most of the equations had their derivations explained well. I noticed that as the topics got more complex, the explanations started to lag. For example, the Pythagoras theorem is explained in a greater detail than Chaos theory. This is unfortunate since the more complex equations obviously require more explanation due to the higher degree of knowledge needed as well as the fact we have been exposed to older theorems during our school or college. A lesser problem but one which I need to point out is that there were some equations which were not covered in this book. For example — the Bayes Theorem or Fermat’s Last Theorem were also equally influential as the others but did not even get a mention in the book. A mention of such topics would have enabled us to go out and research these on our own. This is one of the best books on introductory Mathematics. For the most part, it has a great set of equations which will give us an appreciation for the changes that they have wrought in this world. Less advanced readers will need to put in some effort to understand the more complex topics but this is well worth it.